In the age of technology and social media, it is extremely easy to check up on your partner to see who they are texting, whose photos they are “liking” on Instagram, or what they are looking at online. These behaviors are easy to turn to when you are having a hard time trusting your partner or are feeling insecure in your relationship. You may see their phone sitting on the nightstand and have a sudden and profound urge to look through it. It may seem like the perfect opportunity to “validate he/she is not cheating on me”, “see if he/she is flirting with someone else”, or “find something to use against him/her”. At the same time, you may also feel guilty about violating their privacy and questioning their loyalty. Counselors will tell you that looking through your partner’s phone will not solve the problems in your relationship and rarely makes you feel better. In healthy relationships, both partners should trust each other and respect each other’s right to privacy, personal space, and have a life independent of the relationship. 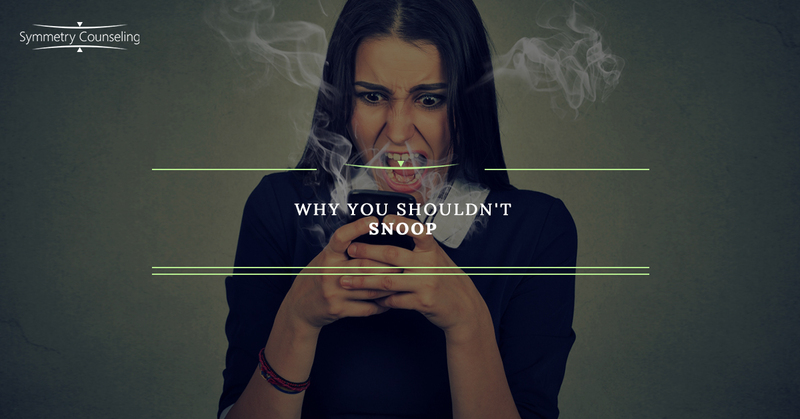 In order to maintain that healthy relationship with your partner, consider these reasons as to why snooping is a terrible idea before you reach for your partner’s phone. Your partner is proving they trust you by leaving their phone unattended for an extended period of time. When your partner finds out you looked through their phone, they are going to feel betrayed, violated, and they may start to question their trust in you. If you want to be with your partner long-term, find a solution to your suspicion that does not involve snooping and work on building trust in your partner rather than violating it. If you look through your partner’s phone, there are there are two common scenarios that may occur. The first is that you find incriminating evidence you were looking for proving he/she is not trustworthy, leaving you distraught. The alternative is you find nothing, leaving you wondering if they did too good of a job hiding something and then feeling the urge to look deeper. Both of these outcomes leave you feeling even more insecure and negative about your relationship than you did before you picked up the phone. While snooping through their phone, you may find pieces of conversations and jump to conclusions. There are private things your partner doesn’t want you to see that aren’t all bad. They may be planning a surprise party or a romantic getaway for you. They may be texting your friend for advise leaving you thinking he/she is cheating. This is just one of many misconceptions that can play out when you go through your partner’s phone that leads to unnecessary hurt and anxiety. So what can you do if you feel your partner may be cheating or you just can’t stop yourself from looking through their phone when the opportunity arises? The best thing you can do is to be honest and bring your suspicions to your partner, allowing them the opportunity to deny or confirm your fears. By doing this, you are showing you respect their privacy, while also communicating your feelings to them. This approach allows for growth in the areas of intimacy, communication, and trust; All which lead to a healthy, strong relationship going forward. If you are currently feeling insecurities and distrust in your relationship and would like support, it may be useful to connect with a therapist. Contact Symmetry Counseling at 312-578-9990 to set up an appointment with one of our very skilled therapists at one of our two Chicago locations.